Today is ANZAC Day, one of the most solemn and significant days on the Australian and New Zealand calendars. Originally a commemoration for the Australian and New Zealand Army Corps (ANZACs) who fought at Gallipoli during World War I, today it also honours all those who served and died for their country during military operations. It marks the anniversary of the first major military action fought by Australian and New Zealand forces in 1915, as part of World War I. 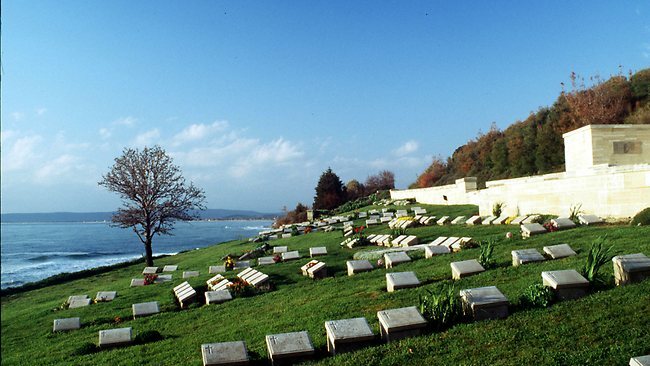 The Gallipoli Campaign took place on a peninsula near the Dardanelles in what is now Turkey, and was an attempt by the British and French to capture Constantinople (now Istanbul), and secure a safe route to Russia. The attempt was a failure for the Allies, and resulted in the loss of many lives. While great military victories are often commemorated as national days of celebration, Australia and New Zealand instead remember this bitter military failure. Although Australia had been independent for thirteen years, and New Zealand for seven, when World War I broke out, many in both countries still thought of themselves as British (they had been, only a few years previous), and had a great deal of faith in the British Empire. The miserable failure of the Gallipoli Campaign did much to shake that faith in British superiority. The stories of courage and heroism from the ANZACs bolstered a feeling of national pride, and a national identity which until then had been lacking. It is popularly said that although Australia officially became a nation in 1901, we only psychologically separated ourselves from Britain in 1915. There is a long tradition of giving children a name to honour military events, and Anzac is another of these. Although the name Anzac is protected by the government to ensure it is not misused, it is permitted to use it on people. It would make a very patriotic name, especially for a child born on or near ANZAC Day. Through reading the historical records, Anzac seems to have been most often given as a middle name. When used as a first name, it was almost always given to boys. As a middle name, it was much more even, but still more often given to boys than girls. Although there seems to be have been a spate of baby Anzacs after the Gallipoli Campaign, it is a name still in use today, and I last saw a baby named Anzac in a birth announcement less than two years ago (a boy). For girls, Anne or Annie could be used as a nickname, and Zac seems most likely for a boy. Thank you to Larkin for suggesting the name Anzac back in early December, and waiting so patiently for ANZAC Day to arrive so that it could be covered! Pingback: The Baby Name Anzac - Nancy's Baby Names - Baby name popularity graphs, meanings, origins, trivia, and more. Browse popular baby names, unique baby names, and everything in between. Thank you for this post! It was really interesting. I quite like Vivian Anzac, but the others are intriguing too – especially the ones that combine more than one WWI reference. I find it strange that Winston Churchill was a namesake, though. As most of the catastrophic events were down to his mistakes. The name does seem very ironic now, but of course during the course of the the campaign, they didn’t know it was going to be failure. I think Winston Anzac must have been born at a time when things appeared to be going well for the Allies. I do hope they didn’t get baby name regret later! So many of the name combinations honour World War I in other ways, such as the Dardanelles; Gallipoli; the Battle of Verdun; France, where so many of our troops died; Lord Kitchener, who was part of the WW I recruitment campaign; Cavel after Edith nurse Edith Cavell; Winston after Winston Churchill, who was in charge of the failed Gallipoli Campaign. That is interesting. I know Dardan and Dardana are legit Albanian names, which is taken from the Dardanelles. It actually does make a great name! I can even imagine someone just named Dardanelle – it’s not much different from Danielle.